Christmas – Birthday – Anniversary – Wedding – Mothers Day – Fathers Day ? Send them to Pembrokeshire Wales for a REAL Adventure ….. Coasteering experience activity vouchers. 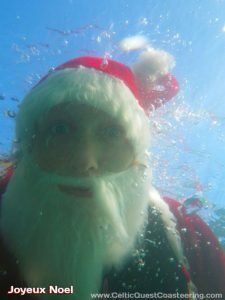 Including a 5mm winter steamer wetsuit (keeping you toasty warm all year), watersports helmet, buoyancy aid, wetsuit gloves, hood and socks. 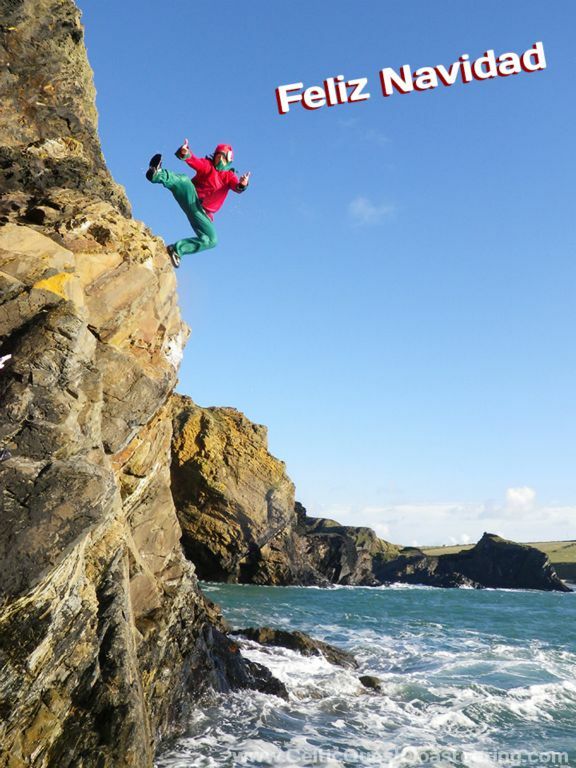 Activity instruction from our professional specialist (and maybe a bit bonkers) Coasteering Guides. 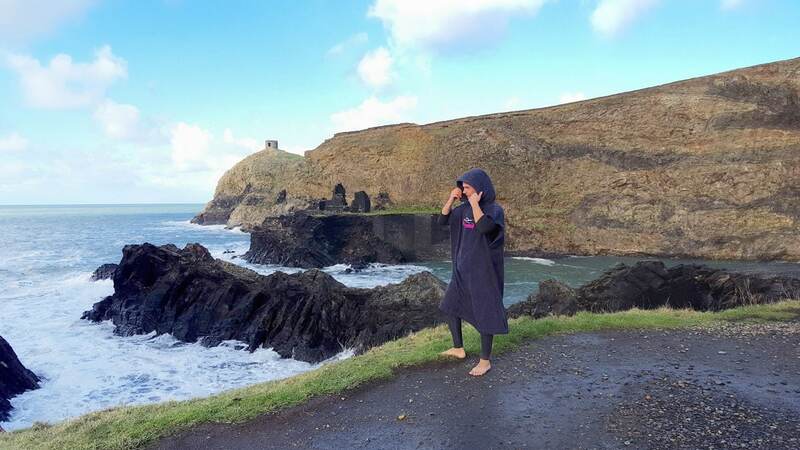 We’ll meet you at Abereiddy beach, so you don’t lose out on time enjoying yourself because of travelling. We’re normally in the water for 2 to 2½ hours. 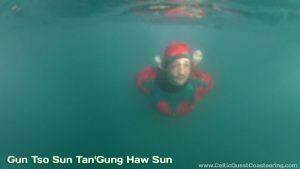 Adventure swimming, rock hopping, cliff jumping, water features (‘Washing Machine’, ‘Toilet Flush’), exploring sea caves, swimming with seals, sea level traversing and not forgetting a dip or jump into the Blue Lagoon. Our Coasteering Gift Vouchers are sent out via email for you to download, print and present or email on to the recipient. Your order is processed by the website itself, so there’s no waiting for a human to do the do, it’s a super quick online ordering system. Don’t wait for the postman when you can print it yourself! 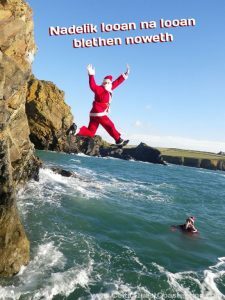 Coasteering Voucher for One Person – Our Coasteering Gift Vouchers are sent out via email for you to download, print and present or email on to the recipient. Personalised with the names of your choice. Vouchers are valid for 12 months from date of purchase. Gift them unforgettable memories, Coasteering in Pembrokeshire Wales UK! Your order is processed by the website itself, so there's no waiting for a human to do the do, it's a super quick online ordering system. Don't wait for the postman when you can print it yourself! Great day out. Excellent value for money. 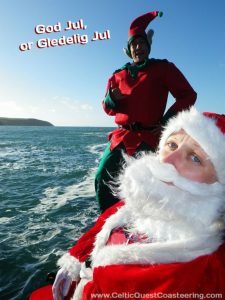 Guides – Cleo and Gaz – were brilliant and put you at ease. Bought as a gift voucher experience – would definitely do it again. Small group – and lots of time to try out different jumps! 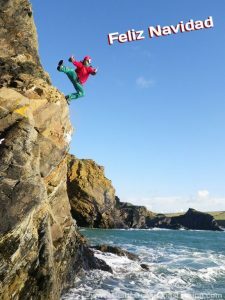 Coasteering Voucher for Two People – Our Coasteering Gift Vouchers are sent out via email for you to download, print and present or email on to the recipient. Personalised with the names of your choice. Vouchers are valid for 12 months from date of purchase. Gift them unforgettable memories, Coasteering in Pembrokeshire Wales UK! Was given a pair of vouchers for this by a friend and had a thoroughly good time with my 13 year old daughter. Well kitted out by the professional guides and was a very friendly atmosphere. Was quite challenging at times and tested your bravery with some of the jumps but we both have some great memories from the morning. would recommend this to anyone but it helps to be a little bit fit for the swimming and climbing involved. 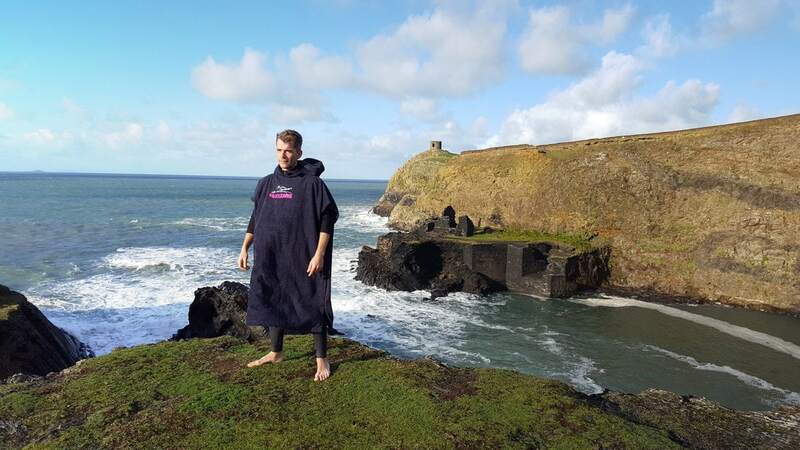 Premium Quality Coasteering Towel Changing Robie • One size adult poncho style changing robe in 100% terry towelling for good absorbency and warmth • Navy/Black in colour • Celtic Quest Coasteering embroidered logo on chest • Price includes Royal Mail Special Delivery (within uk only) • Recommended and used daily by Celtic Quest Coasteering Guides for changing in and out of wetsuits. 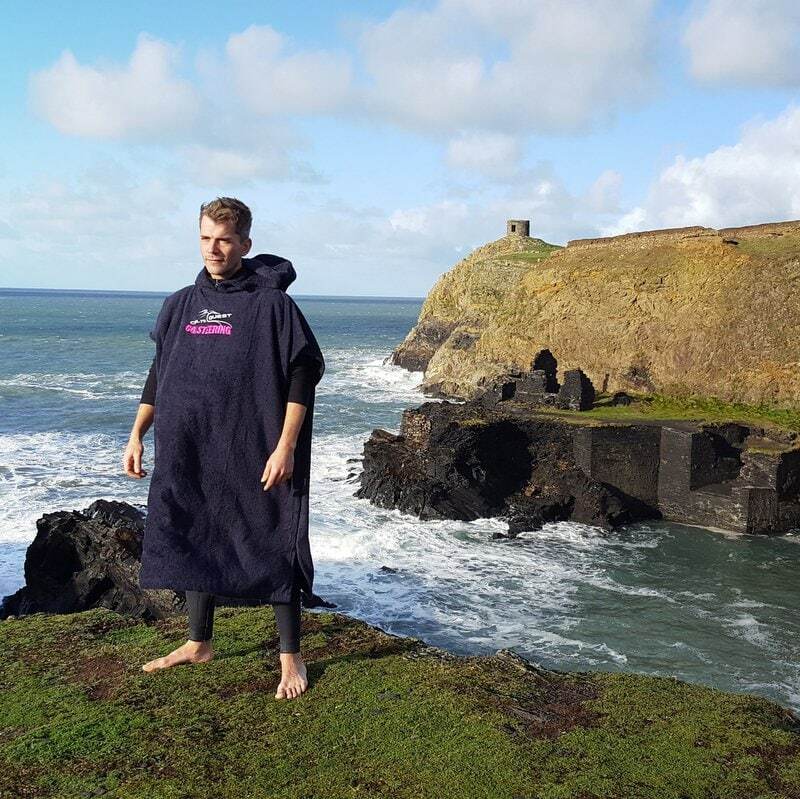 One size adult poncho style changing robe in 100% terry towelling for good absorbency and warmth. 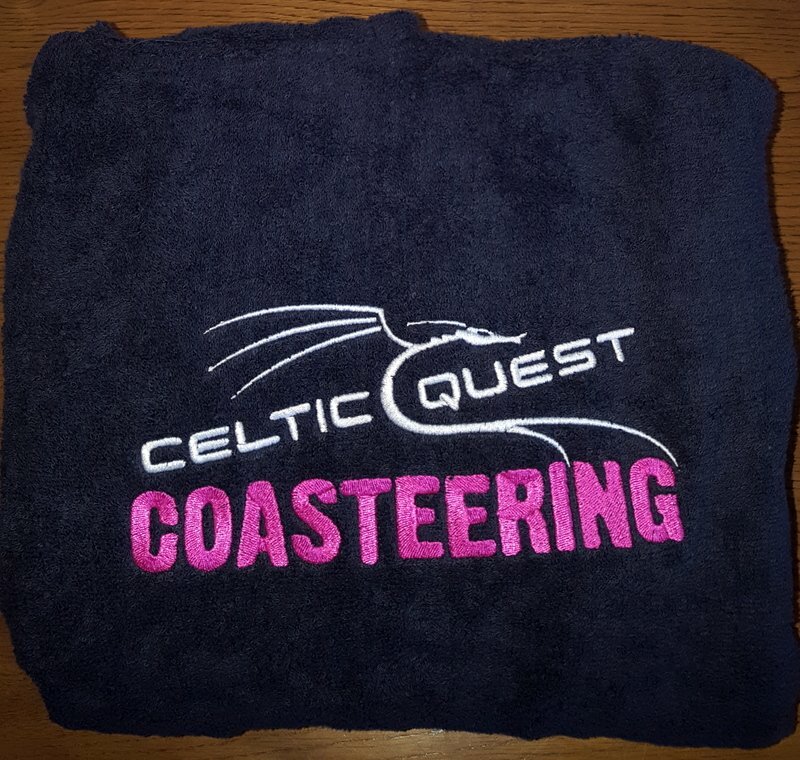 Celtic Quest Coasteering embroidered logo on chest. Price includes Royal Mail Special Delivery (within UK only). 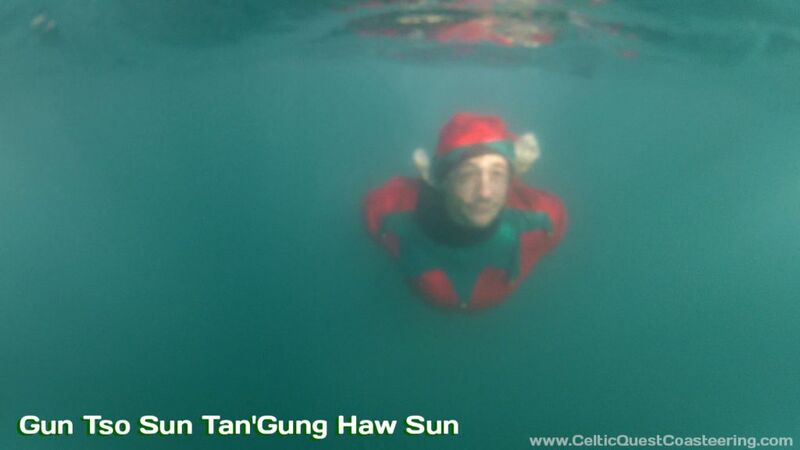 Recommended and used daily by Celtic Quest Coasteering Guides for changing in and out of wetsuits. 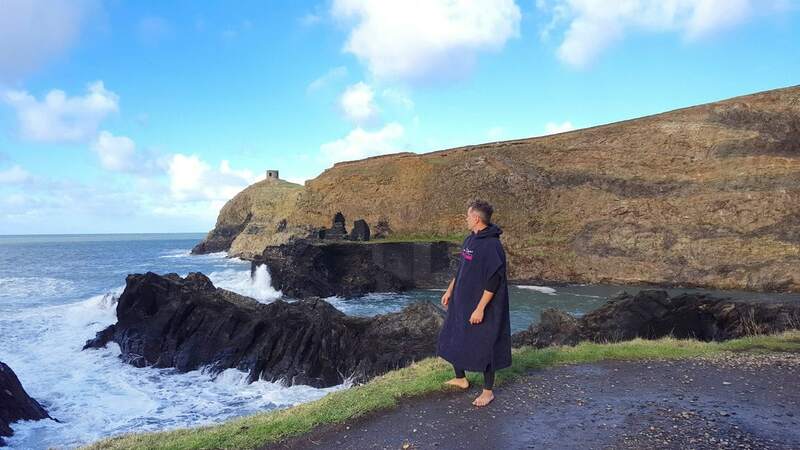 Fantastic must have bit of kit for anyone who spends time at the beach or in water. Quick drying, rare to find a towel that actually dries the skin. 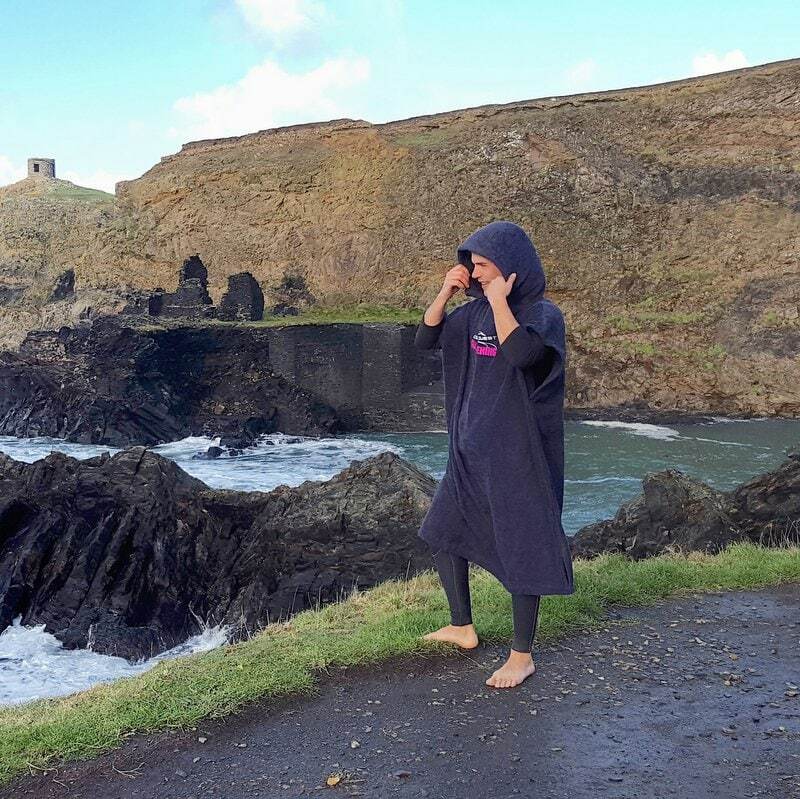 Adult size, it fits great big enough to get changed under! Large hood and arm slots big enough to manoeuvre. An essential bit of kit for us Coasteering Guides. 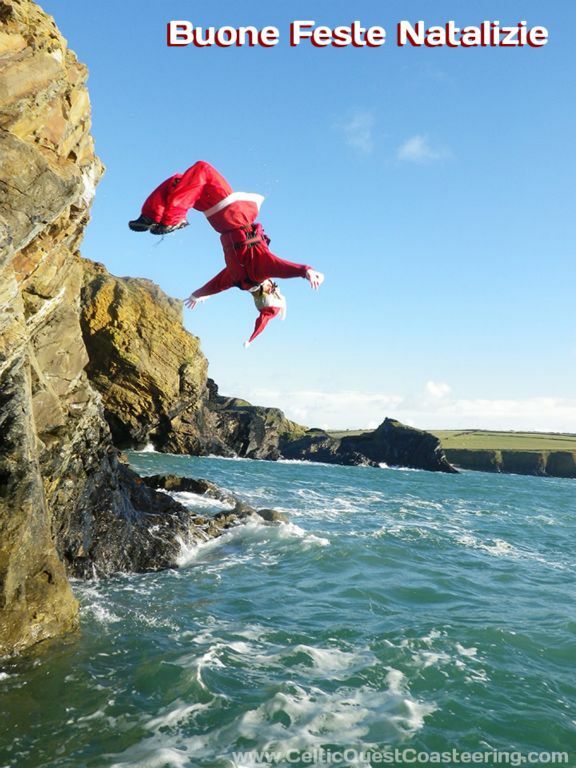 Decide which date you would like join us for your Coasteering experience. Contact Celtic Quest Coasteering on 01348 837337 or email [email protected] to check availability and book. Quote the name/s or code on your voucher. You will receive a confirmation email including your booking details, directions to the beach and a reminder of what to bring. We operate Coasteering adventures all year round, subject to availability. 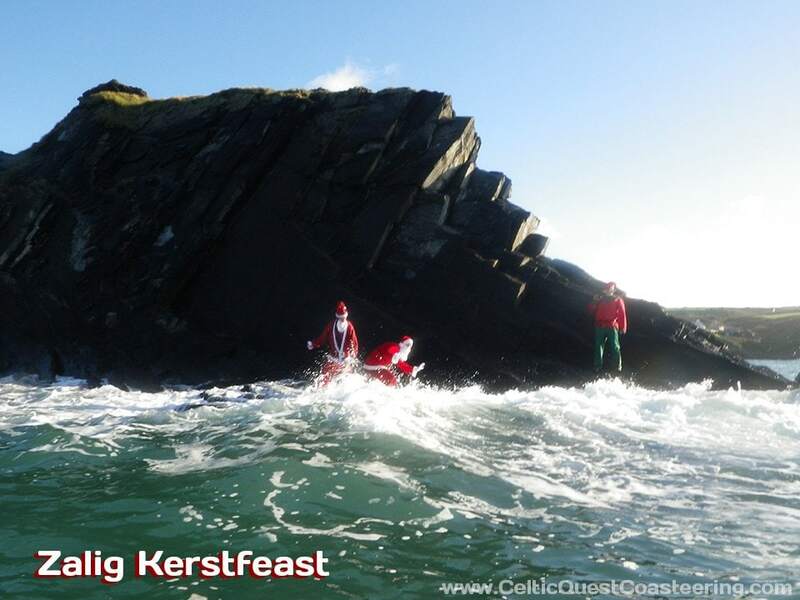 All activity bookings with Celtic Quest Coasteering are subject to terms and conditions. 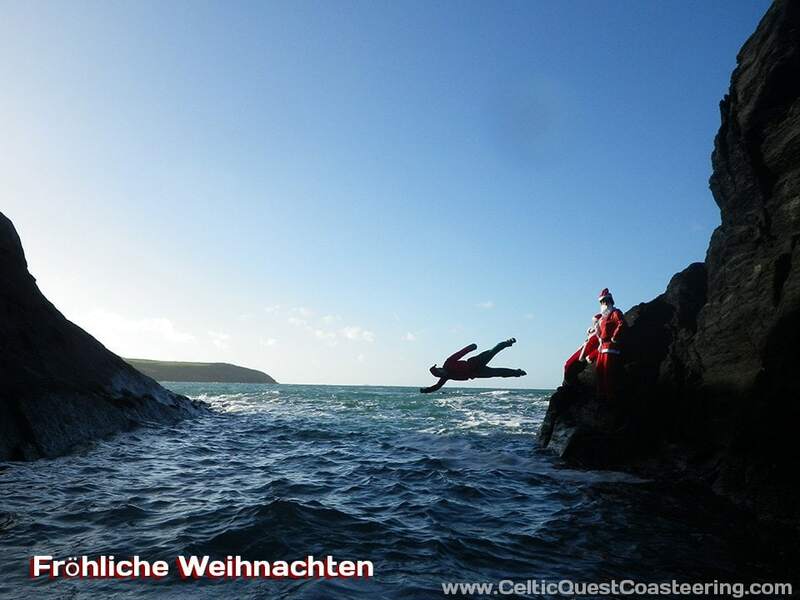 Vouchers purchased from Celtic Quest Coasteering over the telephone or via the internet will be issued directly by us to the purchaser or, on the purchaser’s direction, to another person nominated. 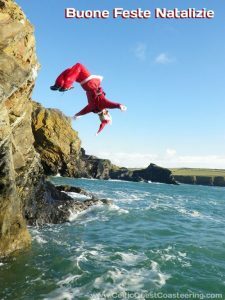 Please read this page carefully before purchasing your Coasteering experience gift voucher. These terms and conditions form a basis of a contract between us (Celtic Quest Coasteering Ltd), and you (the purchaser and/or any subsequent holder of the experience gift voucher). Celtic Quest Coasteering issues face value vouchers (“Card Vouchers”) entitling the Holder to a half-day Coasteering adventure. 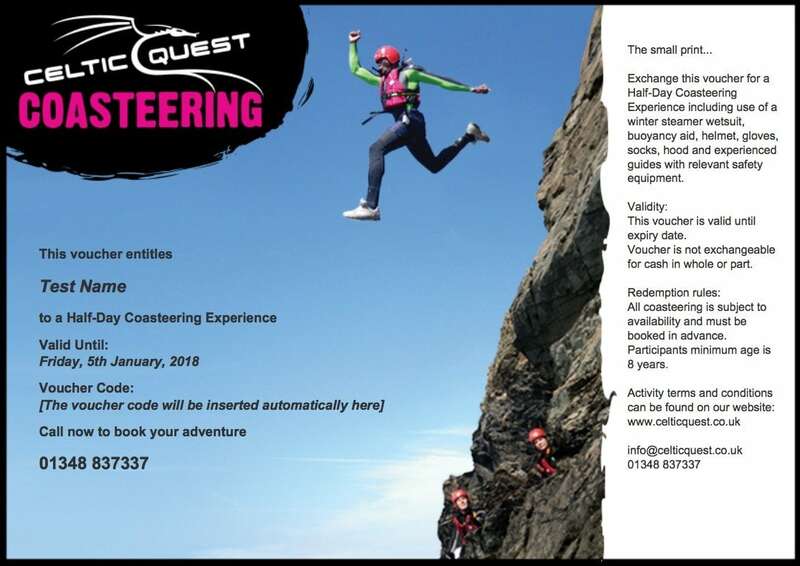 Celtic Quest Coasteering issues face value vouchers (“eVouchers”) entitling the Holder to redeem the value stated on the Voucher towards a half-day Coasteering adventure. 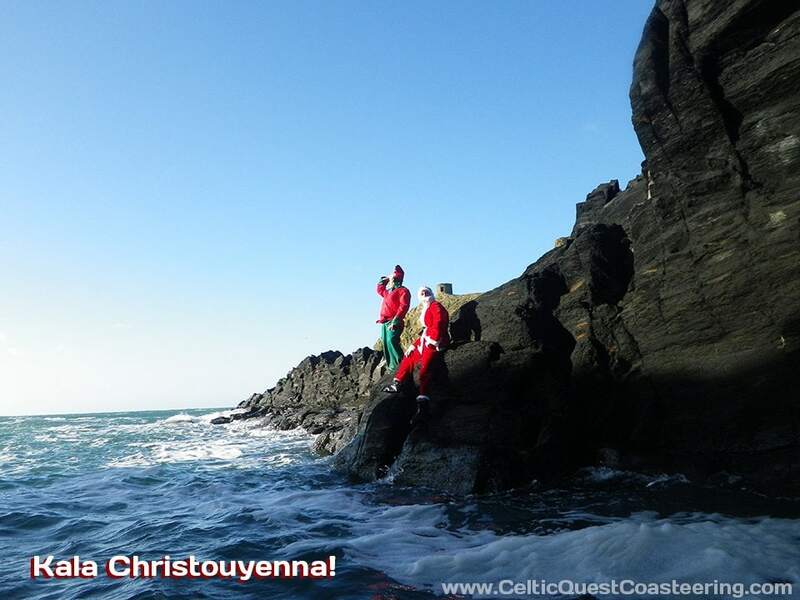 Celtic Quest Coasteering Experience Vouchers are valid for a maximum of twelve months and booking is subject to availability. You will find the expiry date printed on the Voucher. You must book and complete your experience prior to the expiry date. 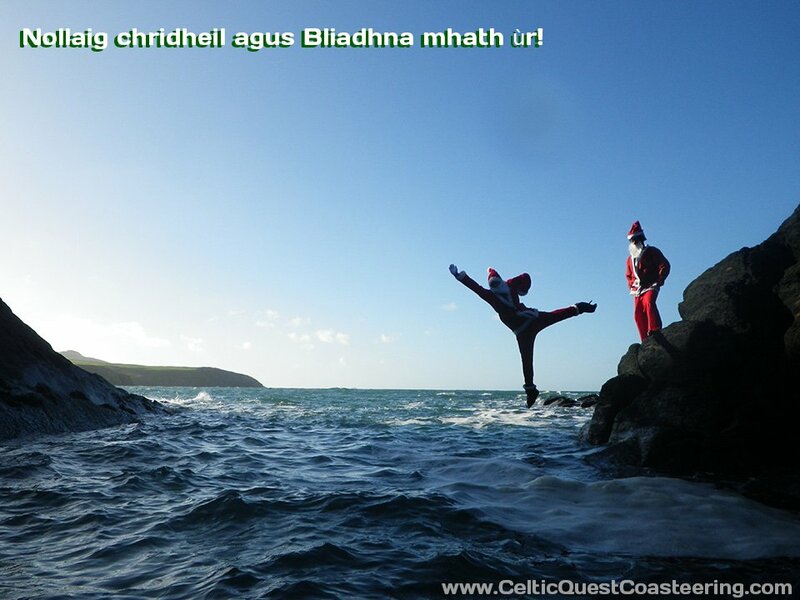 Celtic Quest Coasteering Experience Vouchers are not transferable. 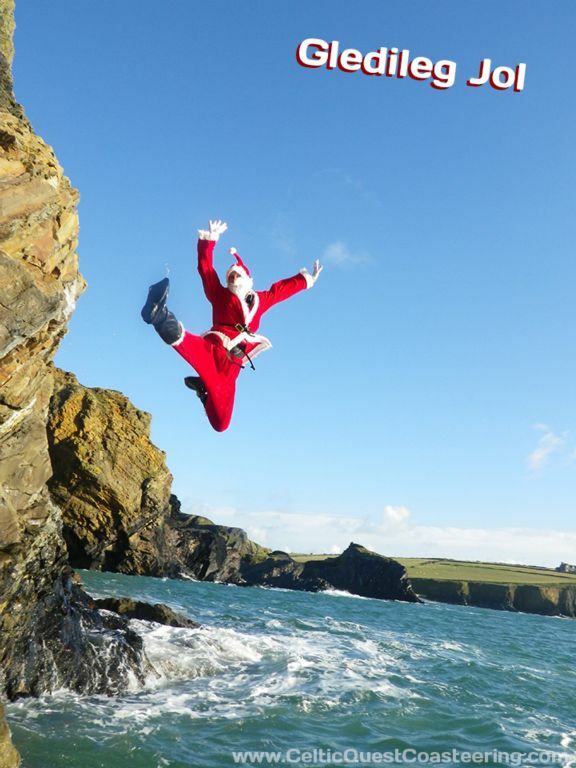 A £20 administration fee is payable if you wish to extend your Coasteering Experience Gift Voucher’s validity by six months. No extended vouchers can be refunded. 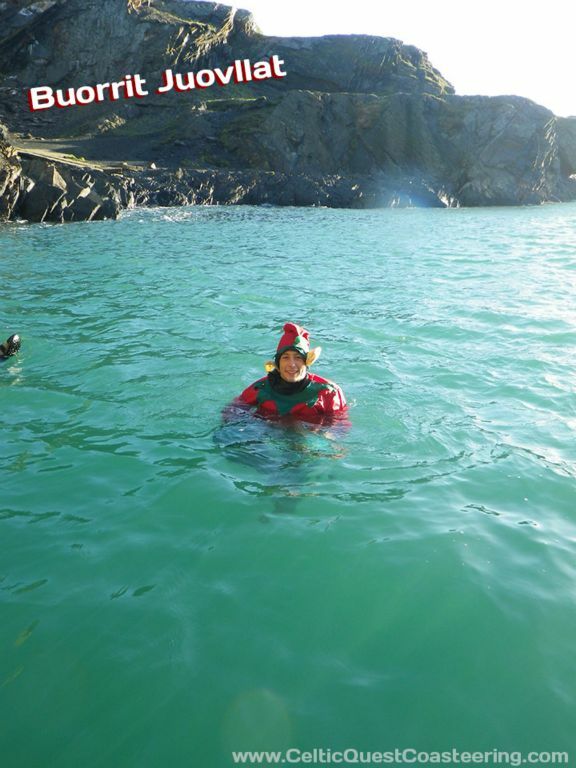 To book your Coasteering experience give us a call on 01348 837337 or email [email protected] You’ll need to quote the name/s or code printed on the Voucher. Customers should note, we regret that if lost, Vouchers cannot be replaced. Please note you may not be able to change your mind once a date has been booked. The price of the Voucher does not include any type of personal accident insurance. 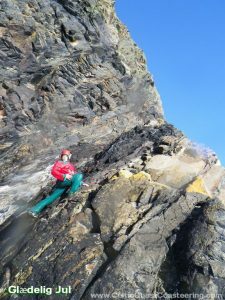 These are given as a guide only, and you may be required to wait between different elements of the Coasteering alongside other participants. For safety reasons you are required to notify Celtic Quest Coasteering of any relevant medical conditions or previous injuries. Our booking office staff can advise of any restrictions at the time of purchase and/or booking. We have tried hard to ensure that descriptions, illustrations and experience titles used in the Voucher, in all our literature and our website are accurate, however, photographs and experience titles are intended to give a general idea of the activity described, and do not form part of any contract between you and Celtic Quest Coasteering. If we cancel your Coasteering, we will tell you as soon as possible, and do our very best to offer an alternative date. 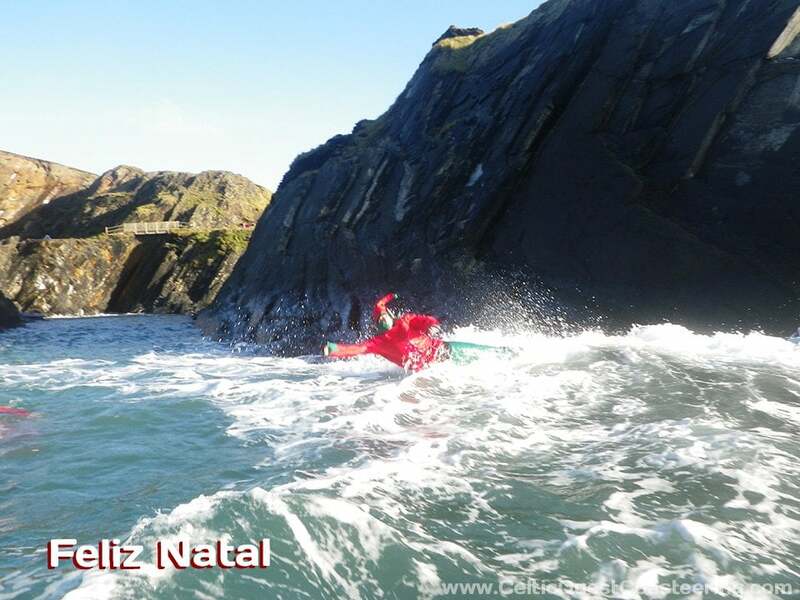 We reserve the right to reschedule the timings of any Coasteering owing to factors beyond our control. 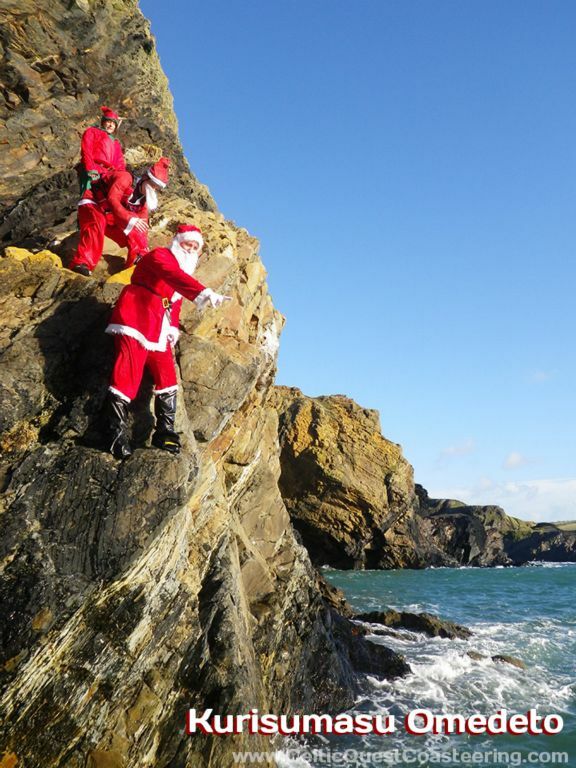 We reserve the right to discontinue the Coasteering at our own discretion. In the event of our cancellation an alternative date will be provided. You should contact us immediately if you need to change or cancel your booking. We will do our best to fill the allocated space, but if we are unable to do so, you may lose your booking. 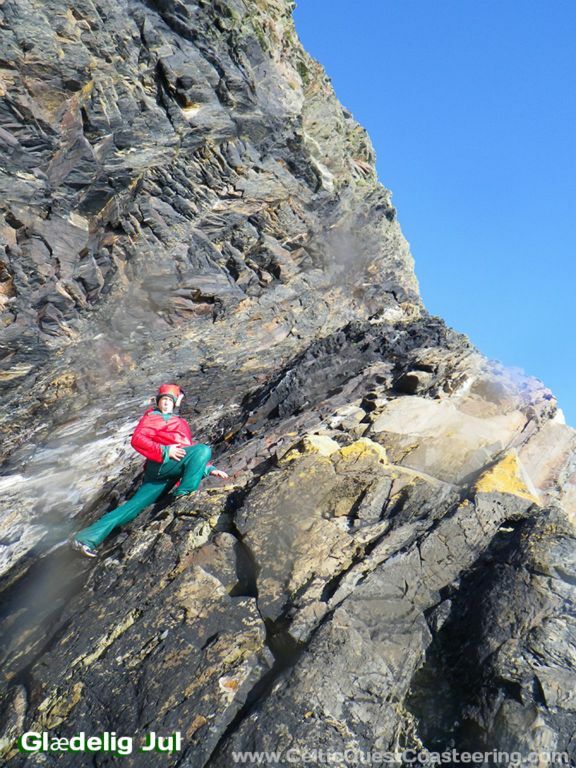 If you need to cancel your Coasteering because of accidental injury/illness to yourself, you should contact Celtic Quest Coasteering as it may be possible to rearrange your Coasteering to another date/time. Activities may be cancelled due to weather conditions, mechanical failure, or for other reasons beyond our control. If your activity is cancelled because of the weather, you will be able to rebook for a date on which you are able to attend. 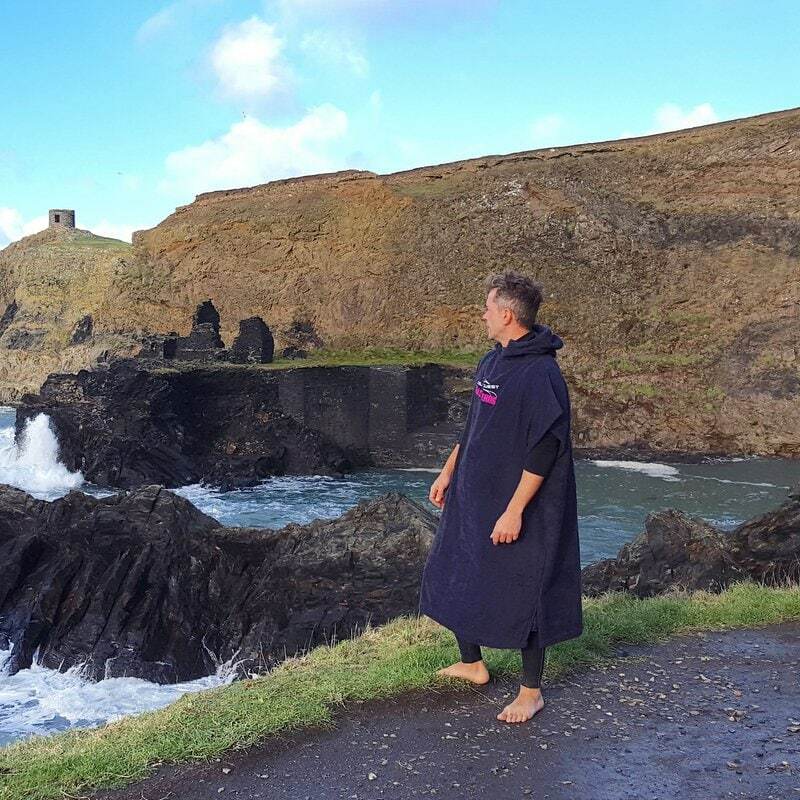 Celtic Quest Coasteering is unable to reimburse travel, accommodation or other incidental expenses incurred by you in attending Coasteering which is cancelled for any reason. 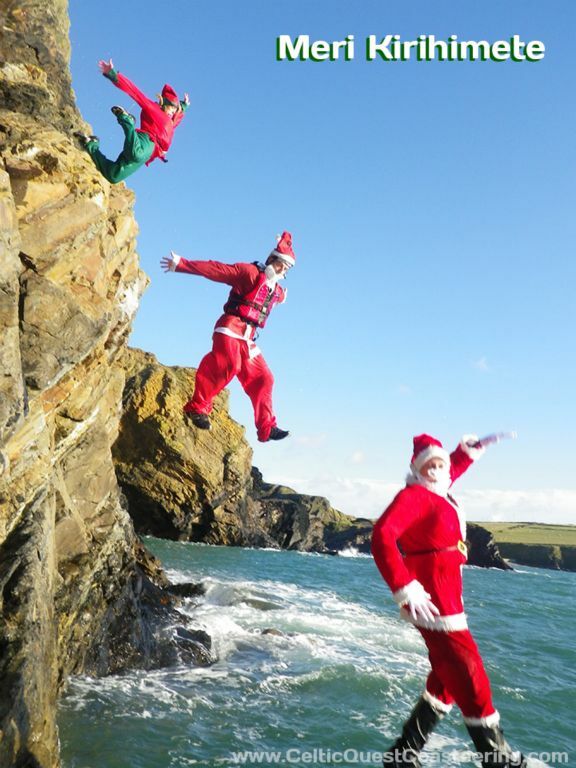 In case of a problem, please speak to the staff at Celtic Quest Coasteering on the day, so they have the opportunity to resolve any problems there and then. 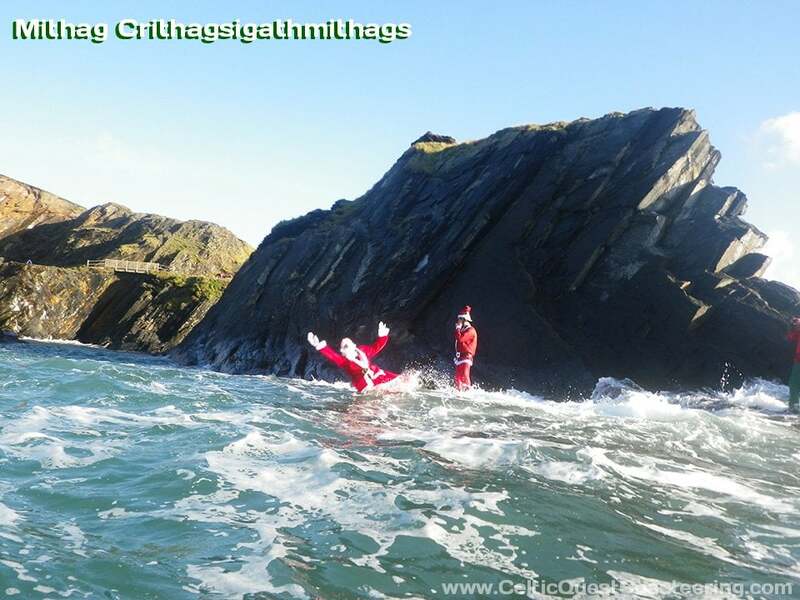 Any other complaints should be addressed with the booking office at Celtic Quest Coasteering. If you are not satisfied with your Voucher, please call us within 14 days of purchase and we will happily arrange a full refund on receipt of your Voucher. Refunds will be paid back onto the credit/ debit card used to place the original order (inc Paypal). No interest will be paid on the amount to be refunded. Refunds cannot be issued once a date has been booked for the activity. We reserve the right to change activity prices without notice, provided we inform you before the activity is booked. Vouchers will not be issued until payment is collected in full. A person who is not named on the face of the Voucher or activity purchase letter has no right under the Contracts (Rights of third Parties) Act 1999 to enforce any terms and conditions of booking. These terms and conditions do not affect your statutory rights as a consumer, and are governed by and in accordance with English law. 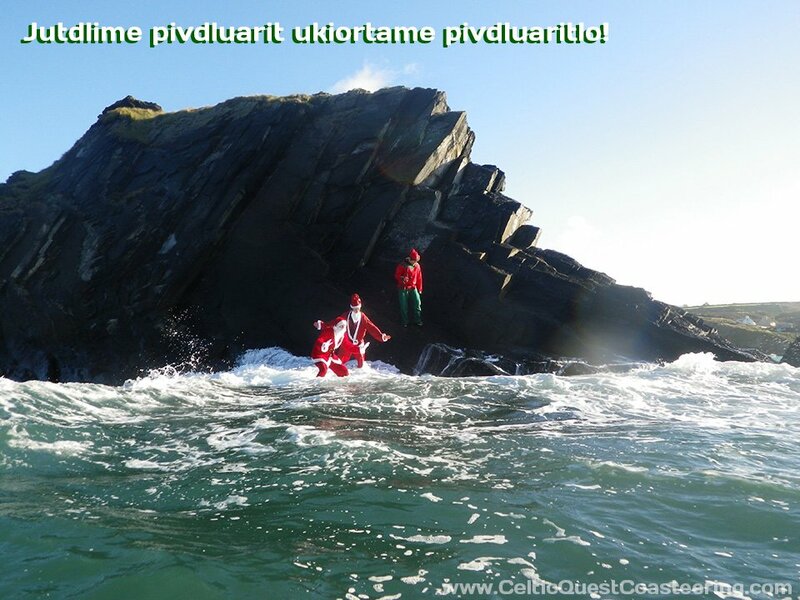 The purchaser and Celtic Quest Coasteering agree that any problems fall under the jurisdiction of the Welsh courts. All the clauses and sub clauses in our terms and conditions are independent of each other. If one clause or sub clause is invalid or unenforceable, this will not affect any other clause or sub clause. Everything your mum and dad told you not to do at the beach! 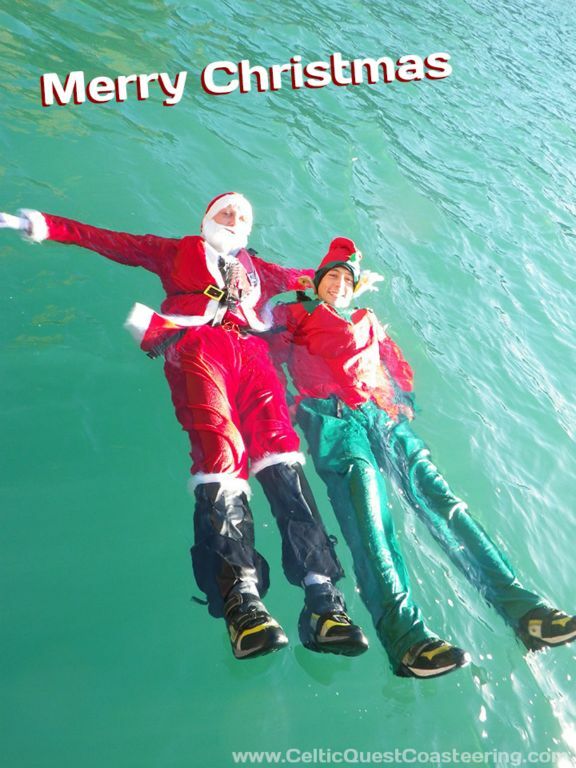 Did we mention it’s probably the most fun you can have in a wetsuit? 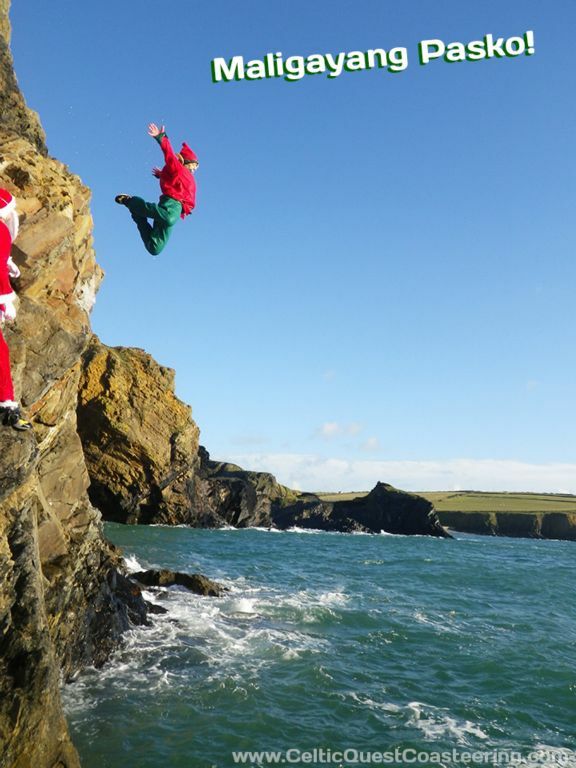 Show someone you really care this Christmas… throw them off a cliff!